Yes, that’s right…it’s blood you’re looking at. 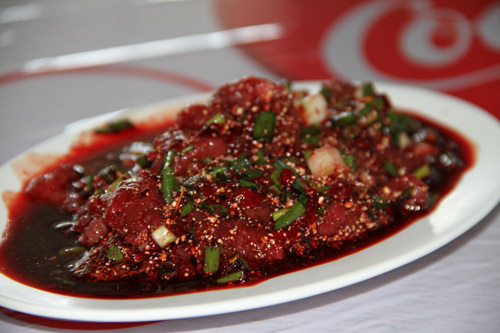 This is a concoction of raw beef and pig’s guts marinated in cold pig’s blood (you can boil the guts if you’re wimpy). This Isaan (Northeastern Thai) specialty is called “Sok Lek” (ซกเล็ก). Seriously, Westerners (or anyone else not from Isaan) are certainly playing culinary Russian roulette when ingesting this stuff. So if you do, don’t skimp on the spices and cheap Thai whiskey…they’re your last defense against parasites. 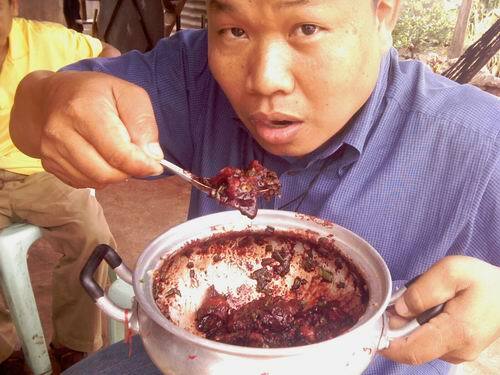 While Sok Lek is a bit of a turn-off for city dwellers, the eating of blood isn’t. Kill a pig, drain the blood into a pan, and quickly add a tad of fish sauce or vinegar to make the liquid congeal. You can dice the end product up like tofu and sell it at the market. In fact, if you ignore the red/brown color, the texture and flavor is actually very similar to tofu. It is normally served in some spicy curry or soup to add variety to the mix.